When I was a child, I was head over heels in love with Tim Burton’s “Batman” The hype the movie created in me could not be filled with whatever toys or video games that came out. The only thing that could quench my appetite for Batman was another movie. 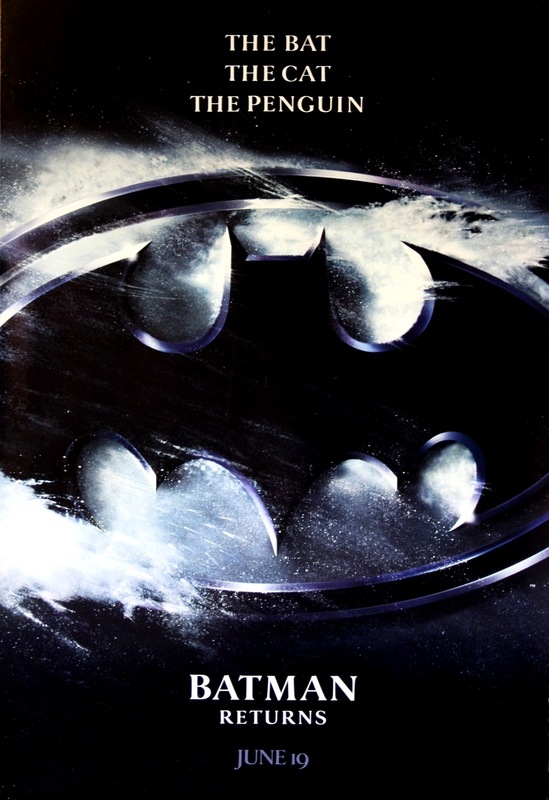 So it was with great anticipation that I sat in a theater in June of 1992 to see my most anticipated movie, “Batman Returns” It took me a while to process my feelings about it overall, but it was nothing like it was when I saw the original. With that film, I was onboard from frame one. When my family got it on video, I’m pretty certain that I watched it nearly every day for a month. With “Batman Returns” I didn’t feel like watching it over and over again. I didn’t really get the movie at all. Looking back now, and having seen it recently, it is easy to understand why I felt this way. 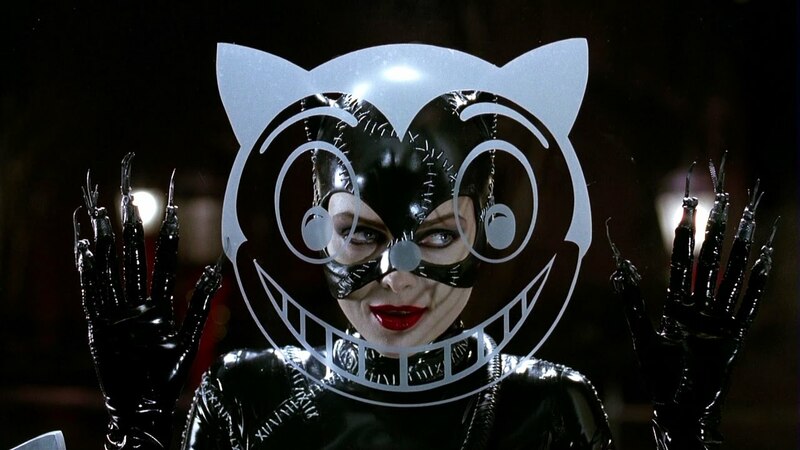 While “Batman” was a more or less traditional superhero movie, “Batman Returns” was a different creature altogether. To be sure, it has all the trappings of regular superhero fare, like the outfits, colorful villains, and vehicles that can easily be made into toys. But look past the surface and what you have is a wholly unique superhero film. It is primarily a story about 3 people who see themselves as freaks and how they deal with the world around them. It just so happens that these freaks are Batman, Catwoman, and the Penguin. 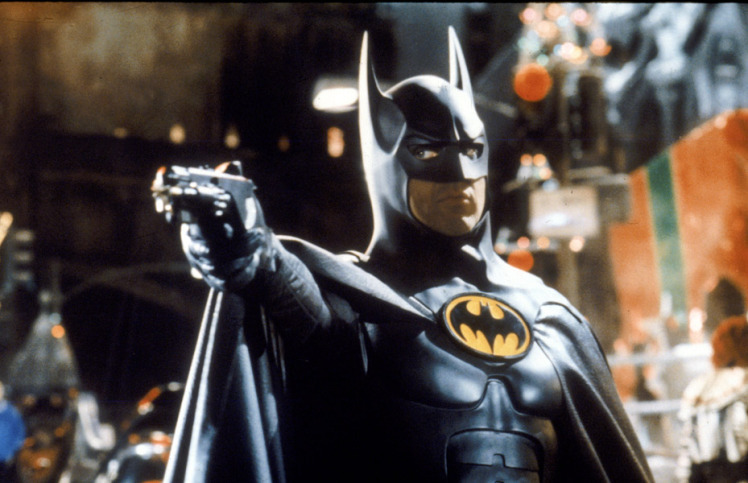 The difference between “Batman” and Batman Returns” can be determined by the level of control Tim Burton had. With the original movie, you could tell Burton was restrained somewhat. He was an unproven director being handed a big budget movie, so he was keeping it safe. Between the release of the original, which was a blockbuster, and its sequel, he had a hit original movie, “Edward Scissorhands” that gave him even more credibility. So when it was time to make the sequel, Burton had way more sway in the decision making process. This is unquestionably a Tim Burton movie. You could say that the original was a Batman movie directed by Tim Burton, and “Batman Returns” was a Tim Burton movie featuring Batman. I think this is a great thing looking back at it. Nowadays you have a lot of superhero movies being released each year, but how many have as much personal vision as this movie? I really can’t think of any. Burton wasn’t deterred by comic book purists who scoffed at new versions of classic characters, he was allowed to walk his own path through the material. The fact that he was able to make the movie he wanted to make is a very good thing. I still remember the furor over how not kid friendly this movie was. When McDonald’s had to pull their happy meal toys, you knew there was a lot of controversy. So it wasn’t surprising that Warner Bros. decided that Tim Burton would not return for the subsequent Batman movie. I think even people who didn’t like the movie would agree that Michelle Pfeiffer was great in it. From the mousy Selina Kyle at the beginning, to her appearance as Catwoman, she steals the movie. The character, like the Penguin, is a re-imagined version of the character. In fact, she is more of a supernatural character in this movie. I wouldn’t even classify her as a villain, she is more of an anti hero trying to achieve her own goals which put her at odds with Batman, and Pfeiffer owns nearly ever scene she’s in. Her different relationships with both Bruce Wayne and Batman are the heart of this movie, with the scene between her and Michael Keaton at the masquerade ball being the best scene in the movie. Danny DeVito is an acquired taste in this movie. When I first heard he was cast in the role, I understood it and looked forward to seeing him in the role. In retrospect, I was anticipating him playing the character the way Burgess Meredith played him in the 60s series. What DeVito was playing here is a fully unique Penguin. Frankly, this is one of the most disgusting characters I’ve seen in one of these movies. 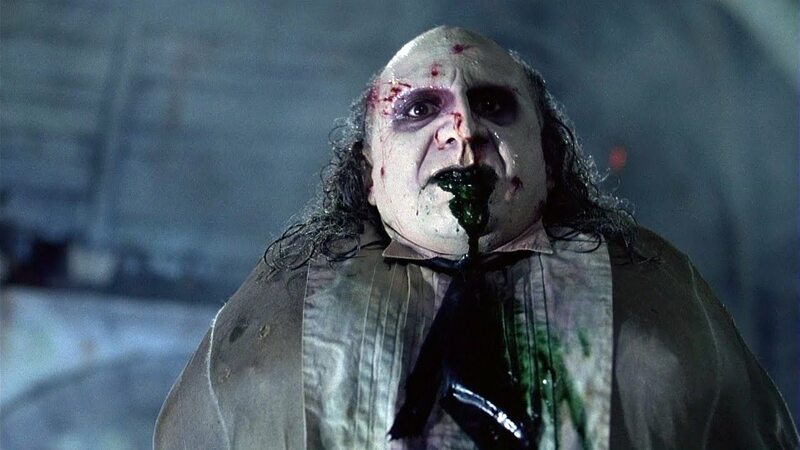 You can’t accuse DeVito of being a vain actor, he isn’t the most attractive person in the world, but the make up he wears in this movie is used to make him seem more like a monster, and he seems to spend a majority of the movie with various fluids coming out of his mouth. An interesting decision is made in this movie to make him a somewhat sympathetic character, literally showing him being thrown away by his parents after his birth. Even after his truly evil plot of killing all of Gotham’s first born sons is foiled, he is given a sympathetic death. One of the greatest elements in the movie is its soundtrack. I think Danny Elfman tops the stellar job he did in the original. Not only is the Batman theme back from the 89 film, it is joined by great new themes for Catwoman and the Penguin. This is really at the height of the Tim Burton/Danny Elfman collaborative period, where Elfman is able to effectively convey what Burton wanted him to at every second of the movie. This is a score I still listen to this day. It is among the greatest superhero film scores of all time, and Elfman’s best score. 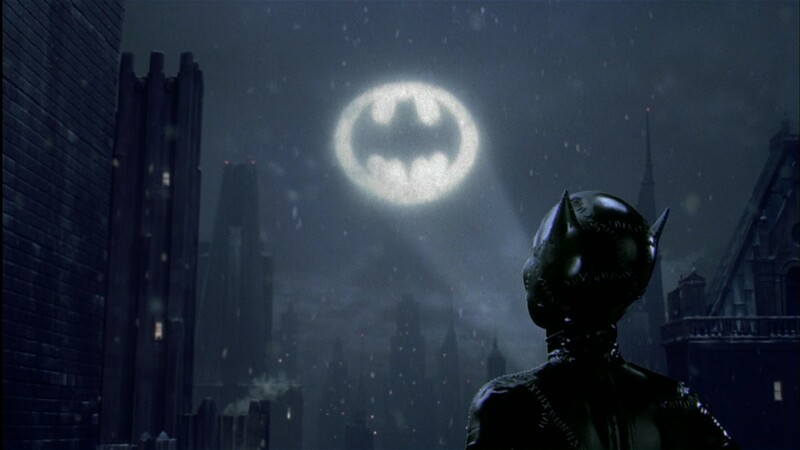 “Batman Returns” also happens to be a great Christmas movie. I can only think of one superhero movie that takes place near Christmas, and it is “Iron Man 3,” which is more of a background detail in that movie. Other than that, “Batman Returns” stands on it’s own. From the snowy opening logo, to the tree lighting ceremony, to the constant snowfall, the Christmas vibe fills the movie. It just is a beautiful looking movie all around. The beautiful white snowfall, combined with the tremendous production design, makes this movie stand out in the pantheon of comic book movies. In the present day, a movie like “Batman Returns” would not be made. Hell, we’re lucky we got it when we did. If Warner Bros. knew what they were getting into before making it, it probably wouldn’t have been made. Their fear at what this movie turned into put them on the road to producing the embarrassment that is “Batman and Robin” So this holiday season, let’s be thankful that a movie this strange and beautiful is out here for us to enjoy.